The laundry, dishes, errands, extracurriculars, doctors appointments, homework, lunches, backpacks, school activities… it all comes at me like a freight train on a treadmilling loop. I contend that we were made for rest – literally. Aren’t we made in God’s image? And didn’t God, the creator of the universe and Lord over all – even smartphones on which we pack our e-calendars – rest on the seventh day (Genesis 2:2)? Does the Bible say to stay busy until you run yourself ragged? Is this how we should honor Him? First, let’s examine why we became so busy. The American Dream is a fantastic thing, but I’m afraid we’ve chosen the Extreme Games version. What started out as an earnest and worthy ode to working hard and making something of our lives has morphed into a perceived obligation to “work hard” at everything we do… even rest. Heaven forbid we not schedule a “leisure activity” during that 45 minutes between gymnastics and choir practice. When I try to make a doctor’s appointment these days, aligning my schedule with the office’s is as simple as a root canal. Each week, I’ve had to add a list called “calendar additions” to my To Do list. Scheduling seems to dive-bomb me incessantly… Sometimes I just want to duck and cover and let the “scheduling bombs” fall where they may. I should put down my smartphone in the name of the Lord. I should ask Him to wash over me. I should pray. Because how can we forge a meaningful relationship with God without resting in prayer? How can we fulfill His deepest desire to have relationship with us without resting in prayer? And this brings me to how Christianity is being eroded by our busyness. How many times have you found yourself too tired to drag yourself out of bed to attend church or bible study? How many times do you have an extracurricular commitment for your precious kiddo that conflicts with church or bible study? What do you choose? I bring this up not to be accusatory, but rather to illuminate my own struggles. I’m so fried from over-scheduling that by the time I get to God time, this girl is nap-bound. I reason that society will judge me less for missing church or bible study than missing my child’s gymnastics meet. And so I’m back to worshipping the idol of busyness over God. The irony of it all is found in God’s offer to give us rest! He so clearly wants to give it to us, and even longs to fold our tired souls into his warm embrace. Just take a peek at Matthew 11:28: “Come to Me, all who are weary and heavy-laden, and I will give you rest.” We just have to listen and go to Him. He is there waiting. So, I’m now on a mission to promote rest. For God, for myself, for moms, for dads, for friends, for we weary American Dreamers who built this country on trusting in God, but just might lose Him to busyness. Maybe the next time someone asks what you’re up to, say you’re enjoying resting. Resist the urge to say “I’m so super busy and feel like I need a vacation.” Consider saying “yes” to God and “no” to busyness. I promise He’ll notice… And maybe even bless you with that nap you’ve been looking for! I loved this…First, let’s examine why we became so busy. The American Dream is a fantastic thing, but I’m afraid we’ve chosen the Extreme Games version. What started out as an earnest and worthy ode to working hard and making something of our lives has morphed into a perceived obligation to “work hard” at everything we do… even rest. Thanks so much for your support, Lori! This neophyte blogger is smiling from ear to ear at her very first positive post comment! Means a lot coming from you since I fell in love with your “No Judgment” post just now! And I LOVED your “No Judgment” post too! So well-constructed/well-worded and packed with solid Biblical truths and thought-provoking questions! I’ll be back for more! So, I just roamed around your site a bit…I love the headlines of what you have written (planned?) for your site. If this is the soft intro before you go “live”, might I suggest you start off with When Norman Rockwell… or One Size… I think those headlines will capture lots of attention – I know I want to come back and read. Thanks a bunch for your helpful feedback! Another first… constructive feedback from another blogger! Yes, love your headline re-ordering suggestions… Heading off to edit! See you back again soon! You are getting off to a great start kiddo (sorry, that’s just because my ship has sailed) There is a lot of focus on ‘rest’ these days, for good reason! Maybe we Americans will get the hang of it yet. Best quote I’ve heard lately is that “we are slaves to our calendars and clocks”. Sorry- I don’t remember who said it. Someone awesome. I look forward to seeing more. Thanks for visiting my blog, and trading links via CWBU. Thanks so much for your thoughtful and insightful comment! Yes, we are totally beholden to time and the technology/tools with which we measure it! Bless you for your support! There’s a big blogosphere out there and stepping into it sometimes feels like walking on the moon! Can’t wait to have you back again and I look forward to following you as well! Great Post! What you said about rest and the physical body is true. I was working overtime, attending bible studies, serving in many ways, and doing almost full-time Masters work. I knew I needed rest, but I ‘had’ to do all of those things. Then my body made me stop, I got really sick and the doctors told me I had to rest. No work, no leaving the house. I was ignoring those whispers from the Holy Spirit to rest and He literally made me. The rest was needed for sure. Thanks for sharing! Hey Josephine! Thanks so much for visiting and for your kind and thoughtful comment! So humbled that God spoke to you! It sounds like you’ve really been through it! I hope heeding God’s #whispersofrest have restored you physically, emotionally, and spiritually. It’s so hard for we empathetic “doers” to rest when we have so many people we want to help! Prayers that God will continue to slip you pockets of rest when you need them so you can continue to do all the things you love and touch others in meaningful ways. Stop on back anytime! I enjoyed visiting your blog too! So proud to know you, Allison! I love this post and can’t wait to see what great things you’ll do with the blog. Congratulations! Aw, thanks, Jennie! Huge heart thanks for supporting me in this project! Thanks for subscribing too! You’re such a dear friend with a huge heart! Love ya, girl! Words that ring true! Finding the balance in life, refilling my tank emotionally, physically & spiritually is a work in progress. Thank you for your words of inspiration and challenge. Your writing speaks to the heart. Look forward to more!! Hey Cary! Humbled that you connected with my little post! Heartfelt thanks for your kind words of support! Can’t wait to give you a big hug of thanks! Your heart is golden! I can’t remember the last time (or if I ever) heard some respond, “I’m resting” when I asked them what they were doing? Sad. I take my cues from Jesus…after all we are to be growing up into His likeness. If Jesus needed time to rest, away from the maddening crowd, don’t I need rest too? Thinking I can do it all and then some reeks of pride. Great post! Thanks a bunch for stopping by and supporting my brand new blog! Heading to yours now! Hi Alison. It’s nice to meet you from #livefreethursday. I love your idea of “rest checking.” I’m stealing it in admiration! Sharing your post on FB and Twitter. Hi Sarah! Thanks so much for stopping by my brand new blog! Humbled you were able to glean a nugget from my post on this #livefreethursday. Looking forward to reading your post! Heading to your blog now! Yay! Here’s to God-rest for you today! I took a 3 hour cell phone hiatus yesterday; it was AMAZING! Thanks so much for your support from H*W! Let me know how I can support you too! This post was such a wonderful reminder for me to rest! I’m actually exploring the same topic on my blog— it’s wonderful to know others are working towards the same goal of rest as well! Hey Rachel! Thanks so much for stopping by my new blog and thanks again for the blog hop op yesterday! Really appreciate all your support and that of CBMM! I love the idea of answering “I’m enjoying resting” rather than”I’m so busy”! I hate the”busy” answer and I really don’t like when I use it. This is a great post and I am going to spend some time thinking on it. Thank you! And yes, Prayer is so important! I can’t imagine where I would be without it! Such a great reminder that rest is needed. And rest is good. I’m reading Present Over Perfect. This idol of busyness that you talk about is discussed in this book. Definitely recommend! Great post!! Hey there! I just finished POP and loved it! Did you do the free Bible study too? It was great! Also, thanks for the great idea… I’m adding POP to the “Dive Deeper” list on this post! Thanks so much for stopping by and for all your support! Heading to your blog! I just started the book and am going through the DVD study with my Bible study. We start the first session Tuesday!! Allison, I was drawn to your post because of your title. I’m doing a series on summer refresh, so this is a perfect read right now. Such a huge benefit we’ve been given in rest, and yet we fail (including myself) to take utilize. I too am on a mission to dwell in rest this summer. Hi Crystal! Thanks so much for stopping by! Best wishes with your series on summer refresh! I’ll check it out! I had to chuckle when I saw the picture at the beginning of your post because that’s what my life often looks like. 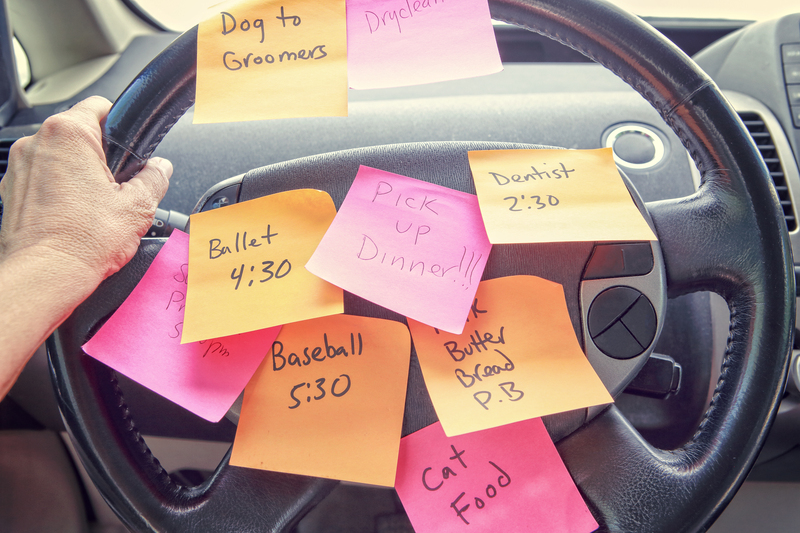 And I really do use sticky note reminders instead of all the modern technology that’s available today. Thanks for sharing a great post! Hi Diane! Glad the image gave you a chuckle! Sounds like your life is as crazy as mine! Thanks so much for stopping by today! Blessings your way!